FlyCorvair.net tops 900,000 page reads. Builders, Last night, the counter on this site went over 900,000 page reads. We are a little less than 100 days from Oshkosh. At the current rate of readership, the site will reach a million page reads before we leave for Oshkosh. This sight has strong readership because it strikes the right combination of information and tone that appeals to traditional homebuilders. It isn’t really a giant amount of hits, but it is plenty to show that the engine is an ever more popular choice for homebuilts, and that we are the source for proven information on building and flying the engine. The Corvair isn’t for everyone, but if you are one of the homebuilders served by the engines strengths and advantages, we welcome you aboard. -ww. Blast from the past: Pictured above in the 2005 Zenith display at Oshkosh, our 601XL, N-1777W, the first Corvair powered Zenith. 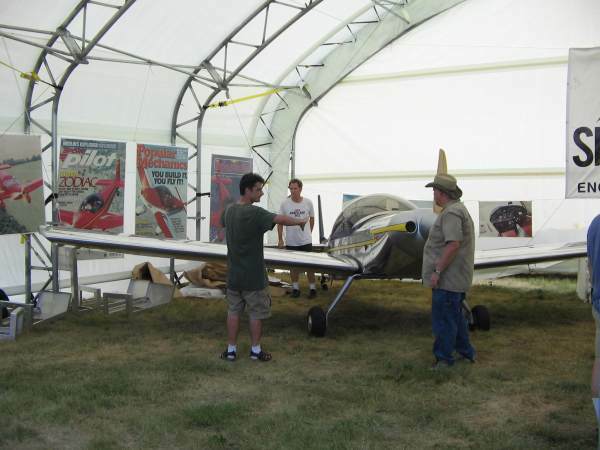 We showed our planes in the Zenith display for 5 years straight. L to R in the picture, Sebastien Heintz, me with short hair, and Gus Warren. Gus and I had just flown up from Florida. For the last six years we have had our own Booth at Oshkosh. This year it is in the same spot, #616, directly across from Zenith’s boothWe have been around experimental aviation a long time. 10 years ago, when the picture above was taken, I had already been building Corvair flight engines for 16 years. In an industry where here today, gone tomorrow companies are the rule, We have earned a place as one of the longest operating companies in our industry.